Welcome to Audiko.net! 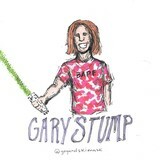 Simply download a free Gary Stump ringtones for your iPhone or mobile. Suit yourself your favorite passage from your favorite track - Halloween Type Beat (Famous Dex x 21 Savage x Smokepurrp Typ, Vangels *F, Sad Igloo *FREE BEAT*, or any other track. Here you can gain your tune both in the MP3 and m4a formats, played by both mobile phones and iPhones. Just select a track, and choose free Gary Stump ringtones download option.